Wanting to fill up that void on a blank garden wall or corner without taking much footprint? Then garden plants in hanging baskets may be your best bet! 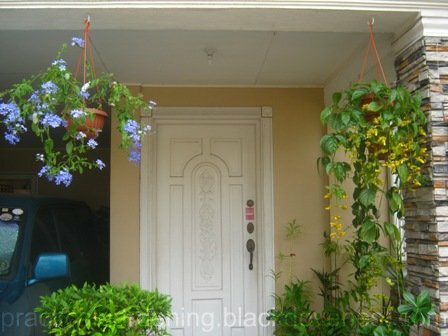 A hanging basket is a suspended container used for growing decorative plants. Typically they are hung from buildings, where garden space is at a premium, and from street furniture for environmental enhancement. They may also be suspended from free standing frames sometimes called hanging basket trees. Although you can make your own DIY or homemade hanging baskets, you may want to avoid that route. This is if you intend to have several hanging baskets lined up and are after that uniform look. After taking an interest with hanging garden plants, I decided to look for hanging baskets that would serve my gardening needs and not break the budget. When you buy garden plants that are meant to be planted in hanging baskets, they usually come in free pots. Traders or sellers put the plants in these makeshift cheap hanging garden pots. These pots are mainly meant to contain and display the garden plants being sold. They're not necessarily good enough especially for putting indoors or in a garden patio. 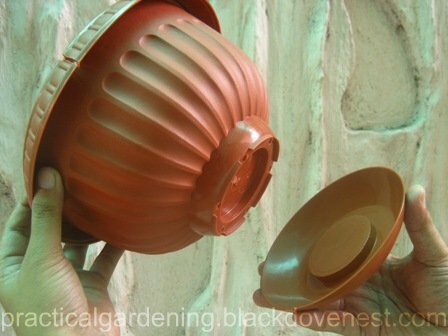 These free hanging garden pots are typically made of generic plastic containers that look like little pails with huge drain holes at the bottom. The pots' hangers are just metal wires formed and joined together. Some of the metal wires are so old or reused many times that rust spots have formed on them. 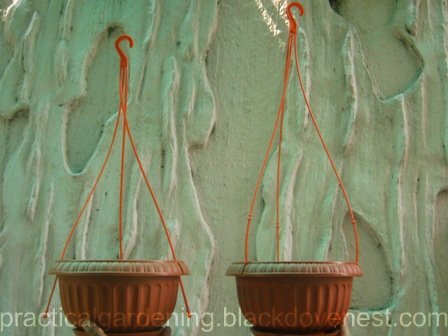 The free hanging garden pots are useful though for your garden nursery. The rusty wire hanger may be removed and discarded altogether and you're still left with a usable garden pot. Recently, hanging baskets made entirely of plastic have become popular. They're cheap, don't rust and are reasonably durable. I found such plastic hanging baskets in shops along Comercio street in Divisoria. The hangers of the baskets are made of rigid plastic and so don't dangle like those made of metal chains. This allows you to easily fasten the hangers on high hooks or brackets without the use of a ladder or stool. 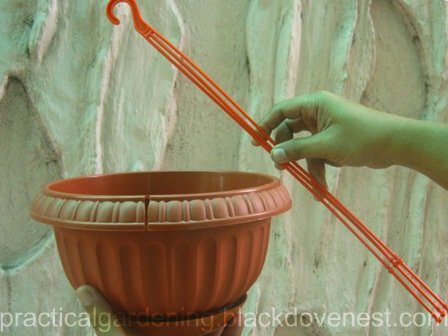 Each hanging basket comes in 2 parts: the basket itself which is 8 inches in diameter, and the plastic hanger as shown below. The plastic hanger has 3 legs to support and carry the weight of the basket contents. To assemble the hanging basket, take one of the legs and choose the level to set the hanger. There's a high and and a low level. Each level has 2 beads (or "bumps") on the leg: the bottom bead and the top bead. The bottom bead functions as a stop and supports the weight of the basket. The top bead secures the plastic leg in place and specifically prevents it from sliding down the slot. In the photo below, the low level is chosen. Position the 2 beads at one of the 3 slots on the basket rim. Insert the tiny space in between the 2 beads into the slot as shown below. 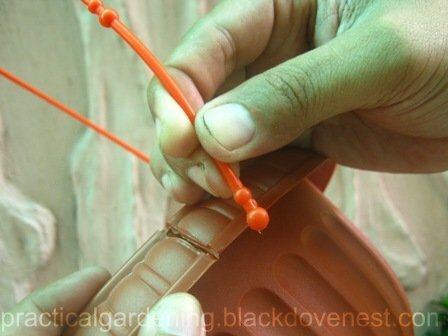 The plastic leg of the hanger will snap into place and the 2 beads will prevent it from sliding. Shown below are the 2 levels for joining the basket to the plastic hanger. The high level shown on the left accommodates small plants that are not bushy or have less foliage. The low level setting on the right allows plants with lush foliage or small plants with vining habits. The hanging basket has a detachable saucer at the bottom as shown below. The saucer acts as a drain tray for collecting excess water. It fits snugly at the bottom but will detach upon prying and tugging it. Here's how the assembled hanging baskets look with plants in them. 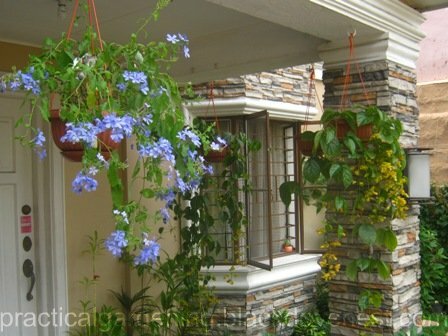 The basket on the left contains a flowering Blue Plumbago (Plumbago auriculata) and is set at the low level to accommodate the lush foliage. The hanging basket at the right contains a flowering Nong Nooch Vine (Petraeovitex bambusetorum) that has long branches that cascade downwards. This hanging basket is set at the high level. Another view of the hanging baskets with garden plants. These hanging baskets were bought at a cheap wholesale price, but for that you need to buy a minimum of 1 dozen. That is just fine if you intend to grow or propagate several plants suitable in hanging baskets. We've taken a keen interest on hanging plants and so we bought a dozen. These, by far, are the cheapest hanging baskets I could find. I've been to local gardens shows where hanging baskets are sometimes sold but their prices are a bit more expensive. Some garden shops in Sunday markets (like in Centris) even charge double for the garden pot prices you can find in big stores like Ace Hardware and Puregold. So be sure to look around first especially if you intend to buy several hanging baskets and garden pots. Along Comercio street in Divisoria in Manila, you'll see lines of shops selling plastic products. Some of these plastic products could easily be used as garden supplies too. In adjacent streets, you will find several selections for potting garden plants. There are hanging baskets, garden pots for bonsai and cacti, seedling trays and more in various shapes and sizes. Don't hesitate to haggle for lower prices. As mentioned, sellers have no problems giving wholesale prices if you buy by the dozen. Notice the above hanging baskets are suspended by ceiling hooks. These hooks are cheap and easy to install. 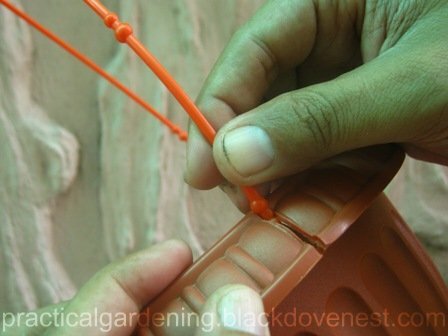 For garden baskets suspended by the wall, you may opt for inexpensive yet functional homemade hanging basket brackets.